Part conference, part spectacle, global chefs' congresses are changing how we all eat. Anya von Bremzen explains. At the Madrid Fusión international chefs' congress in January, Andoni Luis Aduriz, the influential Basque chef, told me a curious story. At another gastronomic summitthis one in Francehe'd watched his equally well-respected peer René Redzepi of Denmark demonstrate a strikingly complex roasted-onion broth. "I was fascinated and began taking notes," Aduriz recalls. "Then René announced to the audience that the broth was inspired by a recipe by...me!" There was a time, not long ago, when such a scene would never have happened. Master chefs kept their ideas to themselves, and an innovative Spanish chef might never have met his Scandinavian counterpart, let alone borrowed his broth. The idea of kitchens without doors, even borders, owes almost everything to the advent of high-powered chefs' congresses around the world. (The Internet has something to do with it, too.) And what exactly is a chefs' congress? Part conference, part trade show, it's where influential chefs demonstrate their latest recipes and techniques on a high-tech stage, in front of an auditorium packed with hundreds of their peers, aspiring cooks and the press. It feels like an haute couture showhighlighting food trends rather than fashion onescrossed with a medical conference. Except that the guy doing the ultrasound presentation isn't a doctor but a chef. In fact, at the 2009 Madrid Fusión, Eneko Atxa of Azurmendi in Spain revealed how ultrasound can help graft the aroma of one ingredient onto another to create, say, a strawberry with the scent of a rose. Following our talk about broths at this year's Madrid Fusión, Aduriz, of Mugaritz restaurant near San Sebastián, Spain, demonstrated a dish: baked Jerusalem artichokes that looked uncannily like the crabmeat he paired them with on the plate. Using a scientific process, he soaked the Jerusalem artichokes in a solution of lime (calcium hydroxide) to form a kind of second skin, which preserved the vegetables' texture while they cooked. The dish was a hit at the conference, representing the newly popular style often called neo- naturalism: earthy ingredients presented with a deceptive simplicity that belies the scientific research underneath. The celebrated chef Yoshihiro Narisawa of Tokyo's Les Créations de Narisawa continued the theme, coating beef in leek ashes and leaving the crowd to ask, half jokingly, whether dashi broths infused with fragrant cedar shavings will be the Next Big Thing. 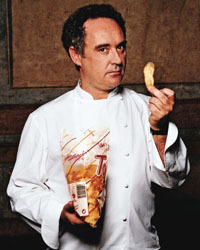 Iconic experimental chef Ferran Adrià, who shocked the Madrid Fusión crowd by announcing that his El Bulli in Roses, Spain, will close from 2012 to 2014, still chuckles when he recalls one of Spain's first food conferences, organized by a local professor in Zaragoza in 1997. "The stage collapsed, the food spoiledit was a disaster, but 800 people showed up, and we realized the importance of exchanging ideas," he says. By launching, and eagerly sharing, the highly scientific exploration of textures and flavors he'd been engaged in for years, Adrià himself became the driving spirit for these gastro-events. In 1999, the Lo Mejor de la Gastronomía congress was founded in San Sebastián. This was a heady time for European avant-garde cooking: Adrià was altering the traditional language of food the way Cubist and Surrealist painters transformed representation through science and imagination. Young Spanish chefs rallied around him with all the urgency of apostles. At the first Lo Mejor event, I was awed by a demo of fish carpaccio with olive oil ice cream from the three-starred Basque chef Martín Berasategui. Blurring sweet-savory boundaries was revolutionary a decade ago; now, I might make such a dish for a dinner party. At Lo Mejor in 2001, the Roca brothers of the groundbreaking El Celler de Can Roca in Catalonia presented sous-vide cooking in an immersion circulator, a method that has since worked its way into countless restaurants and even home kitchens. To the uninitiated, chefs' congresses may seem to celebrate sci-fi cuisine, but the events are helping to spread ideas that change how people cook and, more importantly, think about food. Nordic pickls. Photo courtesy of Cook it Raw! / Per Anders Jorgensen. Lo Mejor was followed by the launch of Madrid Fusión in 2003. Chefs in other nations were watching. "After the jealousy of the nouvelle cuisine generation, young French chefs were inspired by how Spaniards united behind Adrià," says French food journalist Luc Dubanchet. And so Dubanchet started his own congress, Omnivore, in northern France. An Italian critic founded Identità Golosa in Milan. These days, chefs' congresses are a global phenomenon. Japan hosts them, as do Belgium, South Korea and PanamaPanama! Predictably, conference fatigue is setting in. 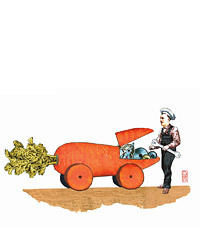 "Enough already with these traveling chef circuses," quips Énzo Vízzari, the all-powerful director of Italy's L'Espresso restaurant guides. "Chefs should stay in their kitchens, performing for diners!" Even alpha-avant-guarde chef Heston Blumenthal, of the Fat Duck in England, is concerned that by watching demonstrations on a stage, "young chefs copy the techniques of particular dishes, but not their logic of flavor." And yet chefs keep coming, traveling around the planet to teach and to learn about ingredients and techniques they'd never encounter if they'd stayed home. Alex Atala of D.O.M. in São Paulo, Brazil's high-profile chef, is driven by his almost evangelical mission to spread the word about Amazonian ingredients. 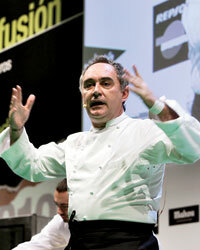 (He's succeeding: Rainforest foods were a sensation at 2009 Madrid Fusión.) Currently, Brazil has two chefs' congresses. One, Paladar Cozinha do Brasil, promotes interaction not among international superstars but among locals, mixing big-city chefs with regional cooks who arrive in São Paulo with Amazonian fish, novel tropical fruits, even ants. "As city chefs discover unfamiliar local ingredients, they teach native cooks about correct temperatures and cooking times," explains Luiz Camargo, a Paladar organizer. "Melding ethnographic ingredients and modern methods helps Brazil forge its own food identity." Courtesy of Cook it Raw! / Per Anders Jorgensen. Recently, at Brazil's other chefs' congress, Semana Mesa SP, I sat next to Atala as a young local chef applied the sous-vide technique to carne de sol, the iconic Brazilian beef jerky. "Our national ingredient cooked with scientific precision," Atala enthused. "This isn't molecular gastronomy; it's a way to advance Brazilian culture!" Later that evening, at D.O.M., I tasted a stunning dessert: transparent banana ravioli spritzed with a caramel flavored with priprioca. This fragrant root, used as a scent by Amazonian people, is one of Atala's latest discoveries. He's extracting its essence with a low-temperature vacuum distiller, a contraption invented by the Roca brothers. "A little Catalan 'borrowing?' " I teased Atala. "Of course," he replied. "And you know what? The Rocas now use priprioca." "Borrowing without shame, that's what all these congresses have accomplished!" Jordi Roca, the young pastry chef at El Celler de Can Roca, said gleefully. And then he went on about priprioca. On a frigid weekend in January I saw Atala again, in the Collio wine region in Italy. The occasion was Cook It Raw!, a groundbreaking, freewheeling eventthe next incarnation of a chefs' congress. Cook It Raw! was launched in 2009 in Copenhagen by a pair of organizers determined to promote a conversation about the environment. In Collio, Atala cooked alongside 12 of the world's most celebrated and progressive chefs, all regulars on the congress circuit, including Copenhagen's Redzepi, Tokyo's Narisawa, New York's David Chang and Spain's Albert Adrià (El Bulli's former dessert guru and Ferran's baby brother). Instead of regular demos, chefs witnessed a pig slaughter and fished in a wintry lagoon. Then they each cooked a dish for a dinner that riffed on the theme Winter Was Hard, using local ingredients and minimal conventional energy. For the dinner, which was part jam session, part reality-show challenge, Chang arranged an assortment of local vegetable kimchi on a plate in the shape of flowers. Atala, the neo-naturalist, snuck the scent of priprioca into baby squid "cooked" by being shaken in seawater ice (a method borrowed from Italian fishermen). Massimo Bottura, chef-owner of Osteria Francescana in Modena, Italy, presented an homage to artist Joseph Beuys that he dubbed an "edible social sculpture" to inspire the world to plant treesraw venison strips, basil seeds, dehydrated polenta and chlorophyll essence. As for Redzepi, the Nordic botanist reimagined one of Denmark's harshest seasons in a dish entitled The Jensens' Hard Winter of 1941. "What would have brightened the day of an average Dane back then?" he wondered. Apparently, the answer was a jewel-like collage of gleaming Danish pickles that included rose petals and elderflower. Together, all these dishes amounted to a breathtaking summary of the past decade's innovations and a glimpse of the future. So what's next after spherified olives and frozen foie gras dust? The really, truly, genuinely exciting answer is that nobody knows. Aduriz once told me that avant-garde cooking might revert to a mid-'80s model: chefs creating eclectic, individualistic cuisines that defy labels and movements. The diverse, highly personal Collio banquet proved that, perhaps, we're already there. Food-and-travel writer Anya von Bremzen is the author of The New Spanish Table.